How the economics of sugar and sugar-substitutes have an impact on the eating disorder related epidemics across the world – from India to USA. 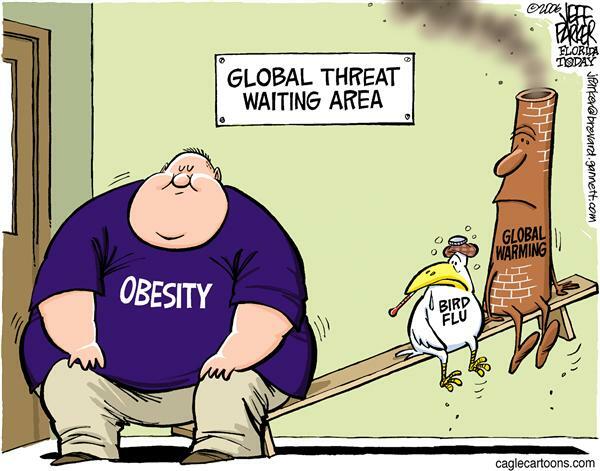 Why is obesity and eating-related disorder rampaging across the world | Cartoon titled Big Problem by Jeff Parker via Cagle Post | Click for image. In 1976, Shashikant Phadnis, an Indian-Marathi student, researching for a pesticide, at King’s College London, misunderstood his professor’s instruction to test a chemical as a request to taste – a mistake common among Marathi and Gujarati speaking-people, who have difficulty in differentiating between a long-sound and short-sounds like beg becomes bag, leg becomes lag – or bag becomes beg and lag becomes leg. Shashikant Phadnis ‘tasted’ a chemical he was supposed to test. That chemical was sucralose – a popular sweetener today that is probably one of the chemicals behind America’s obesity epidemic. 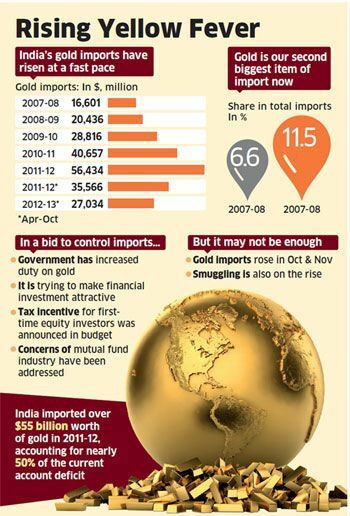 Sugar-substitutes are a billion dollar industry in the US – and in India about US$25 million dollars. The US market is dominated by aspartame (from Nutrasweet; an ex-Monsanto company); acesulfame potassium or acesulfame K (pronounced AY-see-sul-fame-KAY) initially introduced by Hoechst, now Sanofi-Aventis. In the US, Johnson & Johnson promotes sucralose, the Tate & Lyle sweetener, 600 times sweeter than sugar but no calories – sold as Splenda. Cyclamates from Abbot are banned in US – and saccharin remains popular. A rather low-key production and promotion is happening to Neotame – which is 7500-13,000 times sweeter than sugar. For the last 70 years, sugar and sugar substitutes have been big business and backed by powerful lobbies and politicians. Can consumer who bombarded by slick advertising, oily messages from the media, reassurances by the State and the academia have the discretion to over-rule all this and make an informed decision. | Cartoonist(s): Brian Walker Greg Walker Mort Walker; Comic/Cartoon: Beetle Bailey Viewable; Date: 2012-03-29; Pub. Date: 2012-03-29 | Click for image. Why are sweeteners such an important commodity? For centuries, sugar from sugarcane was the best and cheapest source of sugar in the world. According to Indian oral history, sugarcane cultivation was pioneered some 4000-7000 years ago, by the Ikshvaakus – the family of Raghu Ramachandra. Ikshvaaku itself in Sanskrit means cultivators of sugarcane. Till 18th century, the Indian sub-continent was the only principal grower of sugarcane and producer of sugar. Sugarcane remains, even after centuries of research by the West, the best source of sugar – accounting for close to 80% of world sugar production. It is crop that can be grown continuously – unlike sugar beet, which is the distant second-best source of sugar. Sugar beet quickly creates soil fatigue – and crops collapse, unless the soil is given a sugar-beet ‘holiday’ for a season. Continuous cropping also triggers a ‘rhizome-madness’ where the tap-root, which contains the sugars, starts to sub-divide randomly, making any further processing difficult. For the West, sugarcane presents two problems. It grows in tropical climates and needs a lot of labour. Till slave labour was available, sugar cane was equivalent to oil in the 17th-19th century. Sugar-plantation colonies in the Caribbean like West Indies, Cuba, Haiti were prized for sugar production. Inspired by Haiti’s example, as each of these slave-plantations revolted, Western sources of sugar also dried up. In the 20th century, major sugar-exporting countries were Brazil, Cuba, Australia and the Dominican Republic. But, at the slightest hint of international disturbances – like war, sugar stocks would vanish – and the war-mongering nations of the West were left dry. The first attempts to diversify from sugarcane in modern history came from what is now Germany. Andreas Sigismund Marggraf (3 March 1709 – 7 August 1782) a German chemist from Berlin isolated zinc in 1746. Not the first to do so, Marggraf is more famous as he detailed the process and establishing the basic theory of zinc extraction. Next year, in 1747, Marggraf devised a method using alcohol to extract sugar from beets. Prussia (no Germany then) without colonies or the slave labour was dependent on imperial powers for sugar. It was left to Marggraf’s student Franz Karl Achard to breed and improve the White Silesian fodder beet to a sugar beet variety with higher sugar content in 1784. Achard’s work attracted the Prussian Emperor, Frederick William III, to help Achard to start the world’s first beet sugar factory in 1801, at Cunern in Silesia. The French loss of Haiti created a national shortage of sugar – and Achard’s work attracted Napoleon’s attention. 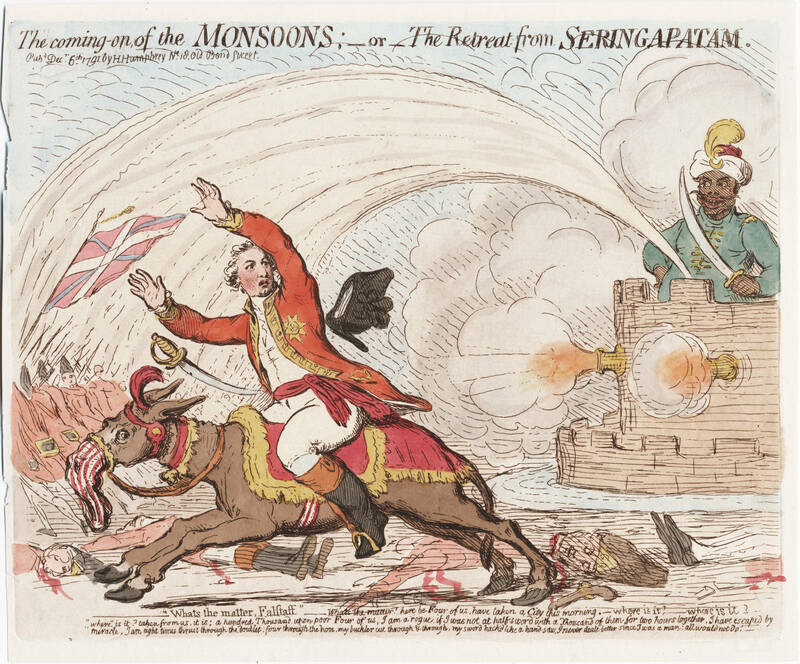 Additionally, the British naval blockade during the Napoleonic wars, made sugar into a scarce commodity. France readily moved to sugar-extraction from beet. US Sweetner Usage – all sources. | Graphic source – pomona.edu | Click for image. Haiti’s surviving sugar-production workers moved to America – giving rise to sugar production in America, using slave labour. This too was short-lived. Except for the last three decades, US has always been a significant importer of sugar – and a principal reason for high sugar prices globally. However sugar production has been a source of friction with Haiti, Dominican Republic, – and most famously, in Cuba. As a global super-power, America could not be seen as suffering shortages – especially of an item, like sugar. Sugar shortages were a Third-World feature. In the Cold War era, Soviet Union was an economy of shortages – and US was the land of plenty. 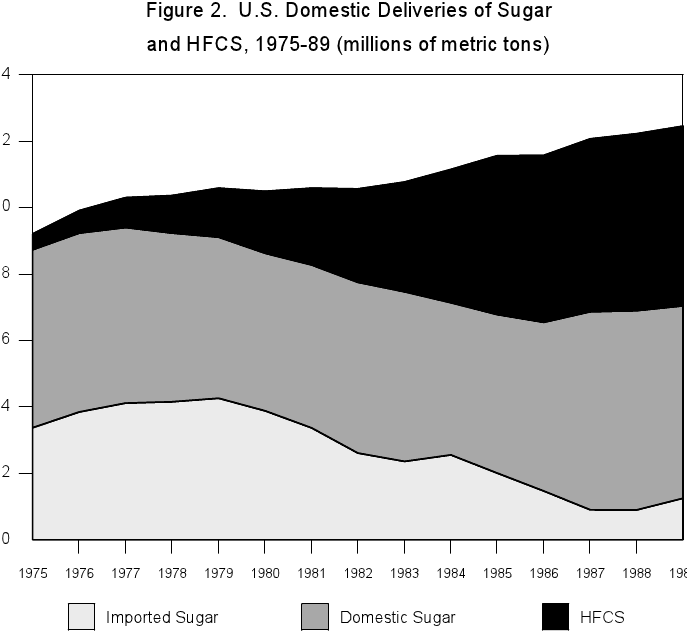 US sought to replace sugar imports which accounted for roughly 40% of US sugar consumption. Apart from increasing sugar production, sugar in the form of high-fructose corn syrup (HF-corn syrup) was promoted. Artificial sweeteners like saccharin, aspartame, sucralose, neotame, acesulfame potassium were permitted – and widely promoted. Imported sugar is now down to less than 10% of total sugars – from nearly 40%. If artificial sweeteners are converted to sugar equivalents, the share of imported sugar will fall to probably less than 1%. HF-corn syrup, which was less than 10% of US sugar consumption, exploded to nearly 50% in a short 10-year period – from 1975-1985. While all these ‘good’ things were happening, simultaneously another bad thing was happening. America goes to fat. 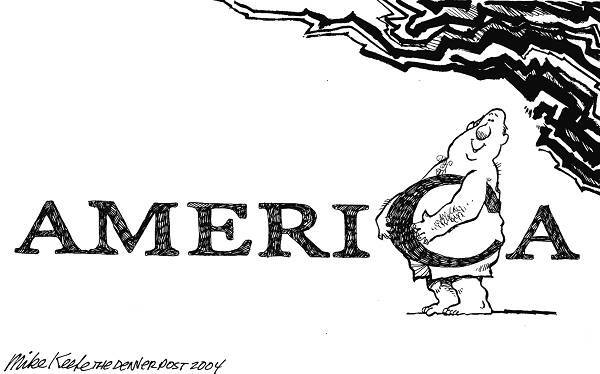 | 14 Mar 2004 – Obesity in America – Daily Political Cartoons by Mike Keefe, editorial cartoonist for the Denver Post. | Click for image. Obesity assumed the proportions of a national epidemic. By the time of the second survey, conducted in the early nineteen-seventies, the proportion of overweight adults had increased by three-quarters of a per cent, to twenty-five per cent, and, by the third survey, in the late seventies, it had edged up to 25.4 per cent. The results that Flegal found so surprising came from the fourth survey. During the nineteen-eighties, the American gut, instead of expanding very gradually, had ballooned: 33.3 per cent of adults now qualified as overweight. Flegal began asking around at professional meetings. Had other researchers noticed a change in Americans’ waistlines? They had not. This left her feeling even more perplexed. She knew that errors could have sneaked into the data in a variety of ways, so she and her colleagues checked and rechecked the figures. There was no problem that they could identify. Finally, in 1994, they published their findings in the Journal of the American Medical Association. In just ten years, they showed, Americans had collectively gained more than a billion pounds. “If this was about tuberculosis, it would be called an epidemic,” another researcher wrote in an editorial accompanying the report. During the next decade, Americans kept right on gaining. Men are now on average seventeen pounds heavier than they were in the late seventies, and for women that figure is even higher: nineteen pounds. The proportion of overweight children, age six to eleven, has more than doubled, while the proportion of overweight adolescents, age twelve to nineteen, has more than tripled. (According to the standards of the United States military, forty per cent of young women and twenty-five per cent of young men weigh too much to enlist.) As the average person became heavier, the very heavy became heavier still. (via Why are Americans fat? : The New Yorker). In the same period that HF-corn syrup and artificial sweetener consumption was exploding, obesity in the US was also growing. America was growing fat. In fact, lot of Americans were growing very fat. Artificial sweeteners, far from diminishing the craving for sugar, seem to reinforce it. Americans ate about 24 lbs. of sugar substitute per person last year, nearly double what they did in 1980, yet sugar consumption rose about 25% in the same period. (via Department of Food Science: The Search for Sweet : The New Yorker). Much like how female foeticide is being portrayed as a social moral failure of people, obesity also is being portrayed as an ethical failure. The truth may be otherwise. In its ability to pack on the body fat, high-fructose corn syrup appears to be worse than sugar. Research from Princeton University looked at how high-fructose corn syrup increases body fat. A research team from Princeton has concluded that high-fructose corn syrup outdoes sugar when it comes to increasing body fat. Researchers from the Princeton’s Neuroscience Institute and its Department of Psychology explored the connection between body fat and use of high-fructose corn syrup. via Jonathan Galland: Worse Than Sugar: What’s in Your Soda?. Was this the entire story. Not quite. Some other studies found that in preparation of HF-corn syrup, mercury-contaminated caustic soda was used to make this ‘natural sugar’. IATP’s Ben Lilliston also told HealthDay that the Environmental Health findings were based on information gathered by the FDA in 2005. And the group’s own study, while not peer-reviewed, was based on products “bought off the shelf in the autumn of 2008,” Lilliston added. (via Study Finds High-Fructose Corn Syrup Contains Mercury). Is the case against HF-corn syrup open-and-shut? Hardly. 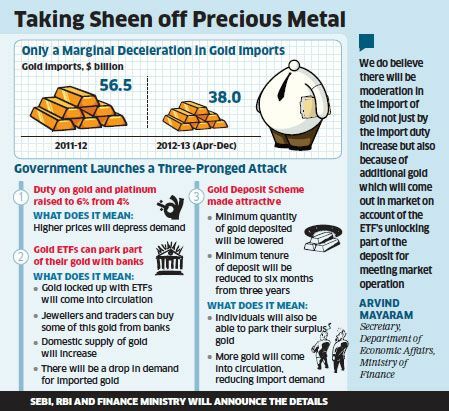 But when, producers defend with a lot of noise, and tricks, surely there is something fishy. In 2008, the corn refiners launched a multi-million dollar advertising and marketing campaign designed to convince consumers that sugar and HFCS are identical. The message was “sugar is sugar” and the ads encouraged people to learn more at CornSugar.com and SweetSurprise.com. The FDA was not happy with this and asked the refiners to modify statements that used the term corn sugar. U.S. sugar farmers and refiners responded by filing a lawsuit which is still pending. (via Feds say high-fructose corn syrup is not sugar – Vitals). How natural is HF-corn syrup? Not very, if this report is to be believed. Massive print and television advertising campaigns by the Corn Refiners Association’s attempt to dispel the “myth” that HFCS is harmful and assert through the opinion of “medical and nutrition experts” that it is no different than cane sugar. It is a “natural” product that is a healthy part of our diet when used in moderation. High fructose corn syrup is an industrial food product and far from “natural” or a naturally occurring substance. It is extracted from corn stalks through a process so secret that Archer Daniels Midland and Carghill would reportedly not allow the investigative journalist Michael Pollan to observe it (via Mark Hyman, MD: The Not-So-Sweet Truth About High Fructose Corn Syrup). The rise of obesity coincides with increased use of artificial sweeteners and sugar-substitutes | Aug 24 2006 Steve Breen’s Cartoon; image source & courtesy – cagle.com | Click for image. How does this obesity story work? There is some understanding – and much of empirical evidence. The key to obesity seems to a complex interplay between insulin and leptin – two hormones that seem to manage metabolic activities. On of the biggest marketing and PR tactics for man-made chemical sweeteners has been the claim that they help in the battle against obesity. Folks, they don’t. They never have and they never will. The research and the epidemiologic data suggest the opposite is true, and that artificial sweeteners such as aspartame and neotame tend to lead to weight gain. There’s more to weight gain or weight loss than mere calorie intake. One reason for aspartame and neotame’s potential to cause weight gain is because phenylalanine and aspartic acid – the two amino acids that make up 90 percent of aspartame and are also present in neotame — are known to rapidly stimulate the release of insulin and leptin; two hormones that are intricately involved with satiety and fat storage. So although you’re not ingesting calories in the form of sugar, aspartame and neotame can still raise your insulin and leptin levels. Elevated insulin and leptin levels, in turn, are two of the driving forces behind obesity, diabetes, and a number of our current chronic disease epidemics. Leptin-resistance also causes an increase in visceral fat, sending you on a vicious cycle of hunger, fat storage and an increased risk of heart disease, diabetes, metabolic syndrome and more. (via Neotame Receives FDA Approval But is Not Widely Used Yet). | The State and its minions have managed to deflect attention away from their faulty products and policies – and instead have pinned the blame on the consumers as being voracious gluttons | Cartoonist: Steve Kelley ; Pub. 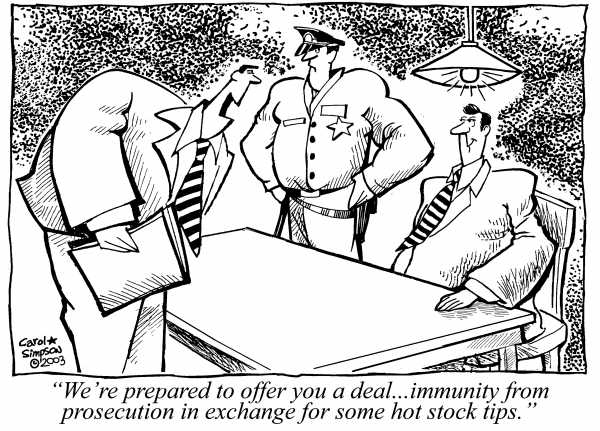 Date: 1999-01-01; souce and courtesy – cartoonistgroup.com | Click for image. Run fast and far, from HF-corn syrup and artificial sweeteners. In a series of experiments, scientists at Purdue University compared weight gain and eating habits in rats whose diets were supplemented with sweetened food containing either zero-calorie saccharin or sugar. Animals fed with artificially sweetened yogurt over a two-week period consumed more calories and gained more weight — mostly in the form of fat — than animals eating yogurt flavored with glucose, a natural, high-calorie sweetener. In 2004, they reported that animals consuming saccharin-sweetened liquids and snacks tended to eat more than animals fed high-calorie, sweetened foods. Susan Swithers, a professor of psychological sciences at Purdue University and a co-author of the study (says) the net result is a more sluggish metabolism that stores, rather than burns, incoming excess calories. Swithers says that the study does suggest artificial sweeteners somehow disrupt the body’s ability to regulate incoming calories. “It’s still a bit of a mystery why they are overeating, but we definitely have evidence that the animals getting artificially sweetened yogurt end up eating more calories than the ones getting calorically sweetened yogurt.” (via Can Sugar Substitutes Make You Fat? – TIME). Calorie-free drinks and diet products seems have a vicious back-lash by the body’s metabolic system. Instead of getting fooled, it seems to simply increase craving, appetite – close to addiction. A ten-year study of almost 500 men and women linked low-calorie soft drinks with bulging waistlines – even when taken in small quantities. Those who downed two or more diet fizzy drinks a day saw their waistbands expand at five times the rate of those who never touched the stuff, a diabetes conference heard. The results were so dramatic that the American researchers advise that people ditch their diet drinks and use water to quench their thirst instead. Those who cannot bear to give up the sugar rush may be better off drinking normal full-sugar fizzy drinks. (via Why guzzling a diet drink can make you fatter – they can trigger the appetite | Mail Online). How the ‘Establishment’ mocks at us – and deflects attention from itself. | Cartoonist: Darrin Bell; Pub. Date: 2012-04-22; source & courtesy – cartoonistgroup.com | Click for image. Some ‘scientists’ have proposed that obesity is an evolutionary response in human beings in the last 20-40 years. several million years of hominid evolution can’t explain why it is just in the past few decades that waistlines have expanded. Kessler invents his own term—“conditioned hypereating”—to describe how people respond to these laboratory-designed concoctions. Foods like Cinnabons and Starbucks’ Strawberries & Crème Frappuccinos are, he maintains, like drugs: “Conditioned hypereating works the same way as other ‘stimulus response’ disorders in which reward is involved, such as compulsive gambling and substance abuse.” For Kessler, the analogy is not merely rhetorical: research on rats, he maintains, proves that the animals’ brains react to sweet, fatty foods the same way that addicts’ respond to cocaine. A reformed overeater himself—“I have owned suits in every size,” he writes—Kessler advises his readers to eschew dieting in favor of a program that he calls Food Rehab. The principles of Food Rehab owe a lot to those of drug rehab, except that it is not, as Kessler acknowledges, advisable to swear off eating altogether. “The substitute for rewarding food is often other rewarding food,” he writes, though what could compensate for the loss of Nacho Cheese Doritos he never really explains. (via Why are Americans fat? : The New Yorker). So, what is emerging from the jigsaw puzzle is public-policy actions by the State and Big Business. Between the State and Big Business, they control and manage our food, appetites, nutrition, diseases, medicine – and information about all this. Media and academia also owned, funded and controlled by the State and Big Business lets us know little – only when forced, in dribs and drabs. 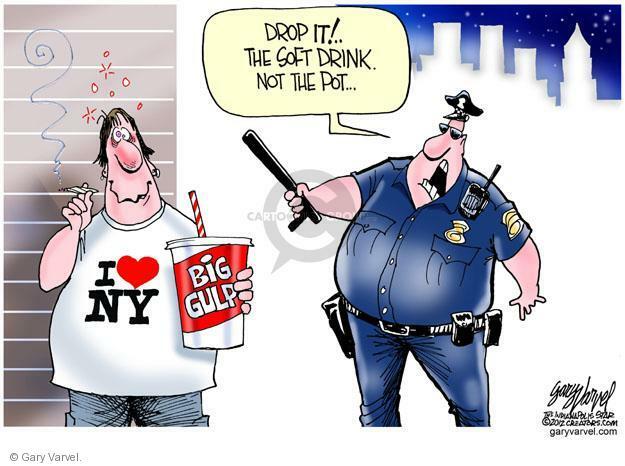 New York has decided that it must legally force food-vendors (like Coke) etc., to reduce the size of each helping. | Cartoonist: Gary Varvel; Pub. Date: 2012-06-06; source & courtesy – cartoonistgroup.com | Click for image. In another experiment, Wansink invited participants to cook dinner for themselves with ingredients that he provided. One group got big boxes of pasta and big bottles of sauce, a second smaller boxes and smaller bottles. 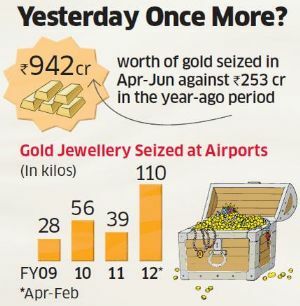 The first group prepared twenty-three per cent more, and downed it all. In yet another experiment, Wansink rigged up bowls that could be refilled, via a hidden tube. When he served soup out of the trick bowls, people, he writes, “ate and ate and ate.” On average, they consumed seventy-three per cent more than those who were served from regular bowls. “Give them a lot and they eat a lot,” he writes. (via Why are Americans fat? : The New Yorker). This super-sized servings are having an effect. We have a curious situation in New York. First the State and its cohorts (Big Business, media and academia) create a problem – and then they display their intent to solve – making the problem, even more complex. New York is trying to take a stand. The city’s mayor, Michael Bloomberg, says he’ll seek to limit sugary soft drinks sold at restaurants, movie theaters and sports stadiums to no more than 16 ounces per cup. A 16-ounce Coke contains nearly 200 calories, or about 10% of your entire recommended daily intake. Beverage companies say the New York plan is nanny-state regulation run amok — and to some degree they’re right. The problem is that leaving people to their own devices is turning us into a nation of porkers. Bloomberg has concluded that to protect the public welfare, we have to save us from ourselves. (via David Lazarus: FDA strikes a sour note for corn sweetener makers – latimes.com). Industrial food inputs are sold to Big Food producers who ‘manage’ Big Retail to give us a choice of unhealthy food in blue, green, yellow colours in peach, vanilla and chocolate flavors. 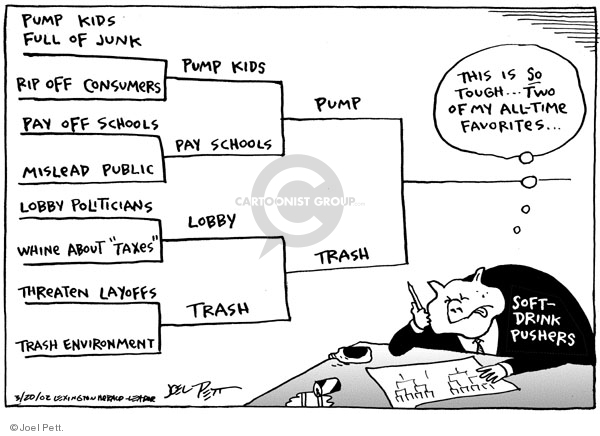 We the consumer have choice | Jeff Koterba’s Cartoon on Jun 20 2006; source and courtesy – cagle.com | Click for image. Are these problems isolated and limited to America. Unfortunately not. “Globesity” (Earthscan; $34.95) takes an international approach to the problem of weight gain. The book’s authors—Francis Delpeuch, Bernard Maire, Emmanuel Monnier, and Michelle Holdsworth—observe that, while Americans were the first to fatten up, they no longer lead the pack. “Like it or not, we have no choice but to face up to the numbers: current data reveal that in Cyprus, the Czech Republic, Finland, Germany, Greece, Malta, and Slovakia, the proportion of overweight adults is actually higher than in the U.S.,” they write. In Asia, Africa, and South America, too, obesity is on the rise. Although nearly a billion of the world’s most impoverished citizens still suffer from too few calories, Delpeuch and his colleagues note that it’s those living just above the poverty level who appear to be gaining weight most rapidly. It may seem to go without saying that being fat is better than starving, but even this truism, the authors argue, is no longer entirely true: in the new world order, it is possible to be overweight and malnourished at the same time. “People on modest incomes suddenly find a cheap, calorie-packed diet within their grasp and make the most of it as soon as they can,” they write. “Unfortunately this means sacrificing many elements that are nutritionally more valuable.” Type 2 diabetes, coronary disease, hypertension, various kinds of cancers—including colorectal and endometrial—gallstones, and osteoarthritis are just some of the conditions that have been linked to excess weight. But, as anyone who has ever gone on a diet knows, weight that was easy to gain is hard to lose. If anything, this is even more true on a societal level. Those politicians who could take the recommended actions tend, the authors of “Globesity” point out, to be in thrall to the very interest groups that are profiting from the status quo. (It’s probably no coincidence that, in a period when the rest of the world has come to look more like Americans, U.S. corporations have been making significant investments—some fifty-five billion dollars a year—in food-processing and distribution facilities abroad.) “To conquer obesity will thus require a complete new awareness, the re-education of the great mass of consumers, and this seems a distant prospect,” they write. 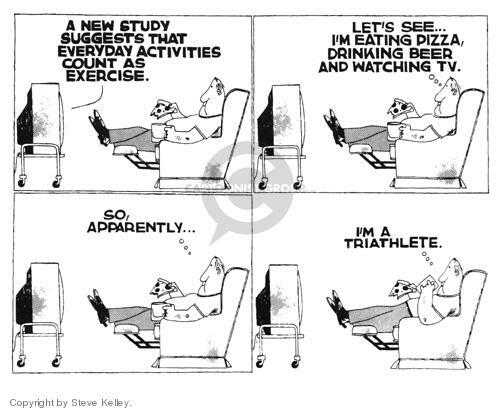 (via Why are Americans fat? : The New Yorker). Tracking price changes in consumer edibles on a gold index reveals interesting correlations. Graphic by 2ndlook. Price data is based on shopping memory og 2ndlook. India has emerged as the diabetic capital of the world. Though Indians have been sugarcane users for centuries, why have we suddenly become so prone to diabetes. When sugar was made at an artisan level – in each village, in many houses, crystalline sugar was discarded. Only raw sugar was used – without refinement, which has no such side-effects. Secondly, if we see the relative price of selected edibles in the last 50 years, sugar has shown the maximum decline. By nearly 1000%. Along with skimmed milk. Probably skimmed milk consumption has not taken off as much as sugar has, it is probably because Indians prefer full-cream milk. But sugar, which was expensive and limited just about 50 years ago, has suddenly become the cheapest, in relative terms. 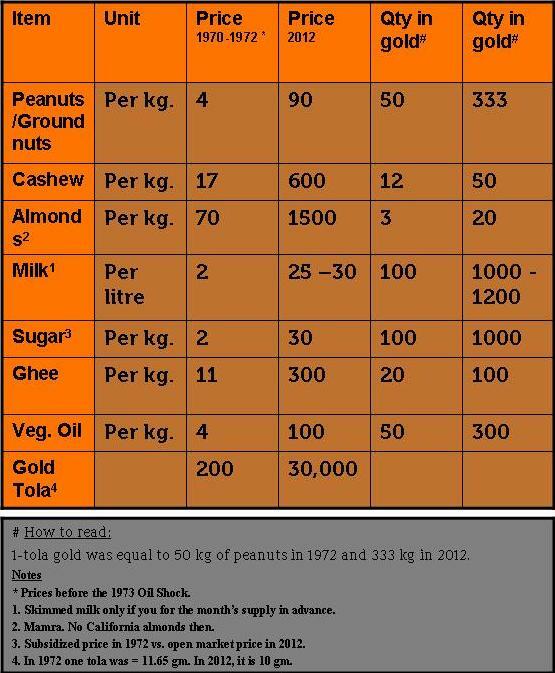 Is this sudden dip in prices, led to a surge in consumption of sugar, that has created a diabetic epidemic in India. The attempts by the Indian State to keep sugar prices low, paid off in the way of increased diabetics? Should sugar prices be allowed to rise – the moment sugar is decontrolled sand sugar exports are allowed. The Powerful Few control our food, medicine, home, work. We can change this | Cartoonist: Joel Pett Pub. 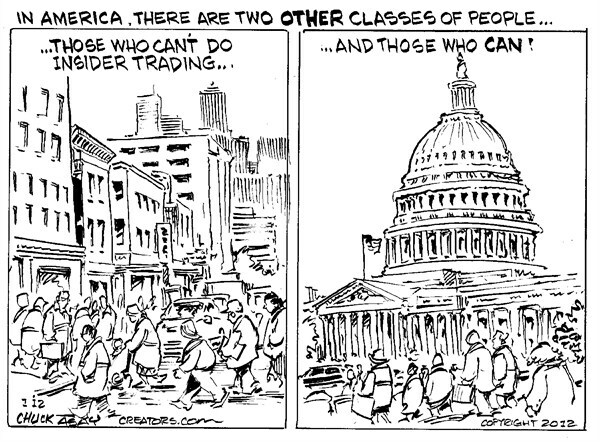 Date: 2002-03-20; source & courtesy – cartoonistgroup.com | Click for image. Is the government really helping people to slim down and avoid foods that pack on pounds and invite the risk of heart disease? High-saturated-fat foods like cheese? Not according to a New York Times expose in 2010. A USDA group with 162 employees called Dairy Management, mostly funded by farmers, is shamelessly committed to getting people to double and triple their cheese intake to replace profits from falling milk sales. According to the Times, Dairy Management has supported Pizza Hut, Taco Bell, Burger King, Wendy’s and Domino’s in “cheesifying” their menu options, putting dairy farmers’ profits before consumer health. “If every pizza included one more ounce of cheese, we would sell an additional 250 million pounds of cheese annually,” rhapsodized the Dairy Management chief executive in a trade publication. Dairy Management received $5.3 million from the USDA during one year, for an overseas dairy campaign, which almost equals the total $6.5 million budget of USDA’s Center for Nutrition Policy and Promotion. That’s the group that tells people not to eat high fat milk and cheese! (via 8 Surprising Things That May Be Making Americans Fat | Food | AlterNet). Farm subsidies, ‘well-intentioned’ with complex justifications have ballooned to US$100 billion across the Western world. What is that these subsidies are achieving? Billions in taxpayer dollars are going to support high fructose corn syrup and three other common food additives used in junk food, according to the report, “Apples to Twinkies: Comparing Federal Subsidies of Fresh Produce and Junk Food,” makes the case that federal farm subsidies are helping feed the nation’s obesity epidemic. The research shows that from 1995 to 2010, $16.9 billion in federal subsidies went to producers and others in the business of corn syrup, high fructose corn syrup, corn starch and soy oils. Among the findings: Taxpayers in the San Francisco area spend $2,762,295 each year in junk food subsidies, but only $41,950 each year on apple subsidies. In Los Angeles, taxpayers spent $13,010,286 in junk food subsidies, and $201,291 on apple subsidies, according to the report. (via Junk Food | U.S. spending billions to subsidize junk food, study says – Los Angeles Times). Not a good feeling, eh?